Jane Haderlein is senior vice president, external affairs at Huntington Memorial Hospital in Pasadena, California, a 625-bed not-for-profit hospital ranked nationally by U.S. News and World Report in two specialties and named among the top hospitals in California. Twenty-six years ago, Robert Fulghum shook up the literary and business worlds when he proclaimed that “All I really need to know I learned in kindergarten.” His simple credo of how to live and what to do went back to the sandbox when he learned to play fair, clean up your own mess, and don’t take things that aren’t yours. It was these and 13 other truths that he suggested adults should apply to their daily living to make life more meaningful. 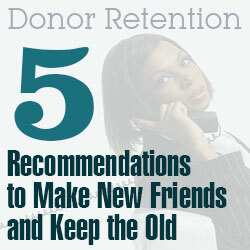 In the fundraising world it’s time to add another: Make new friends but keep the old. Last year Huntington Memorial Hospital in Pasadena, California, raised $13.5 million in private philanthropy. Thanks in large part to this ongoing support, we were able to continue to serve as a vital community resource seeing nearly 26,000 hospital admissions and more than 200,000 outpatient visits. We cared for 1,400 cases of traumatic illness or injury, continued to foster medical and nursing education, conducted programs which encouraged healthy lifestyle habits, and provided a safe and comforting environment for more than 3,300 new babies entering the world. Without philanthropy supporting our not-for-profit mission, much of this would not have been possible. Throughout the year, our institution works hard to cultivate new donors from a variety of sources. These include grateful patients and/or their families who are looking for a way to say “thank you,” new residents in the community who want to protect the safe harbor of local healthcare,local business leaders who know that corporate citizenry is good for business and others from all walks of life whose moral compass steers them toward wanting to do good for those less fortunate. But while new donors are critical to any nonprofit’s ongoing sustainability, the lifeblood of philanthropy is donor retention.Existing donors already feel an affinity toward our hospitaland have shown through their generosity a sincere desire to support the work we are doing. Theses donors come in all shapes and sizes. Some we hear from once a year when they attend our annual fundraising event and enjoy the feeling of having fun while doing well. Some have made major gifts toward a capital campaign while others give gifts not as large but just as sincere. Some have expanded their financial contributions by giving in other ways, such as volunteering or bringing their friends (and potential donors) to our door. Some want to leave a legacy, while others merely want to live out the true meaning of the word “community.” And for many repeat donors, charitable giving breathes more meaning into their lives. While their motives and level of contribution may vary, they all have one thing in common: They have shown their support for Huntington Hospital and, as such, are deserving of our respect, admiration and gratitude. We think they are worth something else, too: personal and genuine communication. People like to know that their money is making a difference work and serving the intended purpose. For that reason we make it a point to send handwritten, personal letters (or quick notes) to many donors with a simple but sincere “Thought you would like to know” message. Even more powerful than coming from philanthropy, these letters take on heightened muscle when signed by a physician thanking the donor for helping to provide, for example, diagnostic equipment that is saving lives every day. Such a program need not be confined to healthcare. Wouldn’t donors to veteran organizations love to hear directly from a veteran that their donation has helped?What about a letter from a student thanking an art museum donor for helping to enrich their lives and open up to them a new world of beauty and imagination? Think of how much more impactful that would be than merely another in a long line of form-letter solicitations, which too often and too quickly find a home in the recycle bin. Effective donor retention needs constant feeding or, put another way, ongoing communication trumps one-time communication. The trouble is most ongoing communication that donors receive is nothing more than another direct and impersonal solicitation, often coming at an annoying rate or asking for increased donations (which is often interpreted as ungratefulness). What about peppering these solicitations with other forms of communication?To do this organizations should develop an ongoing program of donor communication that involves a variety of messaging and touch points. In addition to the “Thought you would like to know” messages mentioned above, organizations can send impact reports or annual reports, hand-signed letters from the CEO or board chair, invitations to events, reprints of articles a donor might find of interest, and so on. People want to know that your organization thinks of them as more than an ATM. They are a person with needs, wants, wishes and desires. They want and have earned your respect. And in showing it, you earn something in return: their trust. If we see a pattern of (for example) annual donations from a donor not otherwise connected with our hospital, the obvious question is why? With all of the worthwhile causes competing for the same charitable dollar, why does this person continue to give to Huntington year after year? What is the connection? What is the motivation? The answer won’t be found in a crystal ball or Ouija board: The only way to answer these questions is to ask. Why not give this person a call and invite them to lunch? The invitation needs to come with a “no solicitation” promise, but simply an overture for a “get to know you” conversation. Admittedly, many will be skeptical and decline the offer. But even if they do, they will more than likely be touched that the offer was made and that, in and of itself, may further bond them to your organization. For those who accept the invitation, the knowledge acquired from time spent together will not only serve to solidify that relationship, but is marketplace intelligence that can be applied throughout your fundraising efforts. It also gives your fundraising team the opportunity to do the most important thing of all: listen. People’s lifestyles change; and, with it, often changing, too, are their interests, their reasons for giving,and their potential ways of doing so. While most donors enter the door through traditional financial giving, one of the most important things a nonprofit can do is create a variety of portals through which existing donors can remain engaged at the level of their choosing. Cultivating donor relationships means being open to understanding how best to serve our donors’ needs with sensitivity and integrity. Consider, too, gifts of assets and real property, as well as a wide variety of trusts that may enable the donor to realize his/her own objectives now and to help answer the organization’s needs at a later date. But none of this can be done unless you really know the donor as well as his and her philanthropic goals. There is a story about a great French marshal who once asked his gardener to plant a tree. The gardener objected, saying that the tree in question was slow growing and would not reach maturity for 100 years. The marshal replied “In that case there is no time to lose. Plant it this afternoon.”Like that marshal, fundraisers know that great things take time. And perhaps nowhere is this truer than in building an effective donor-retention program. While we can breathe a sigh that you don’t need to wait 100 years for maturity, be sure that your donor-retention program carries with it the patience to be strategically grounded and systematically carried out. And as new donors are cultivated, ensure that you have a methodology in place to smartly integrate them into your donor-relations efforts while keeping your long-standing donors gratified. Remember: One is silver and the other gold.